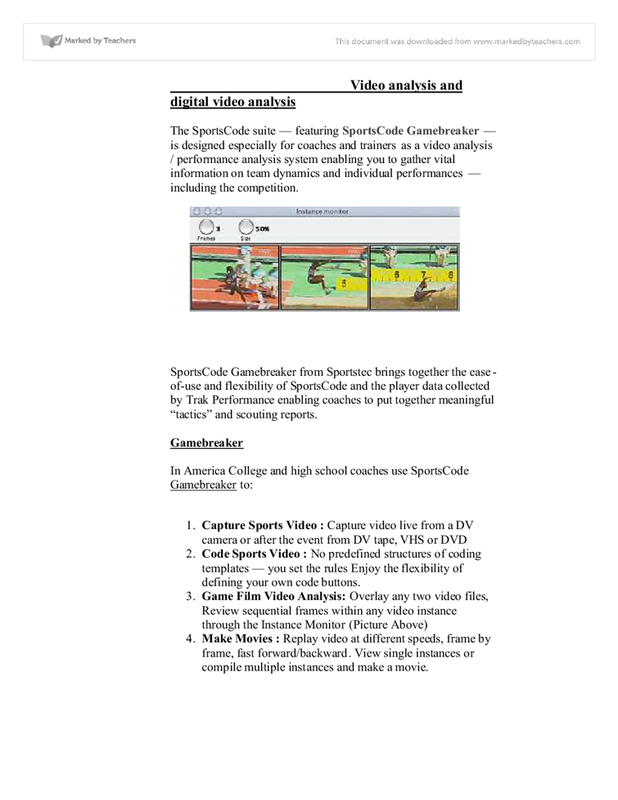 The SportsCode suite — featuring SportsCode Gamebreaker — is designed especially for coaches and trainers as a video analysis / performance analysis system enabling you to gather vital information on team dynamics and individual performances — including the competition. SportsCode Gamebreaker from Sportstec brings together the ease-of-use and flexibility of SportsCode and the player data collected by Trak Performance enabling coaches to put together meaningful “tactics” and scouting reports. Code Sports Video : No predefined structures of coding templates — you set the rulesEnjoy the flexibility of defining your own code buttons. Make Movies : Replay video at different speeds, frame by frame, fast forward/backward. View single instances or compile multiple instances and make a movie. SportsCode is a revolutionary sports video analysis tool that analyzes any combination of play, by player or type of play. SportsCode is highly sophisticated performance analysis software, the ultimate tool for performance recording, in-depth analysis and individual player development. It is used during performances for comparisons and fine-tuning, then afterwards to coach players or teams with a comprehensive database of video and statistical information. 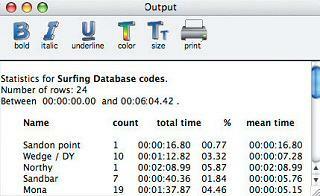 The number of times each code was used e.g. Red possession. How much time those actions took e.g. 40 minutes. The percentage of the total performance time those actions took e.g. 66%. The mean time for each action e.g. 20 sec’s. SportsCode provides split screen and overlay analysis tools, great assets when you want to highlight differences in technique and to compare similar actions such as a soccer free kick, football pass play or basketball foul shot. CODA is the latest addition of products, and it can dramatically change coaching staff's game analysis capabilities. CODA runs on palm size PDAs and enables you to set up user-defined templates for Live Coding. These are all good for the athletes that take their sport very serious and want to improve in every way possible. In 2007 Chelsea Football Club goalkeeper Petr Cech used video analysis after making a mistake in a London Derby match, after watching the video of watch happened he then decided to improve on the weakness with the advice of his coach. 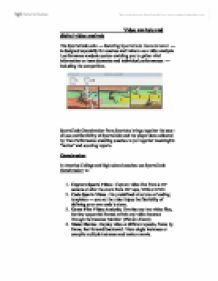 When using analysis software to scale video frames and locate points of interest frame-by-frame, they are required to make judgments and understand the analysis process. Video analysis allows for study of two -dimensional motion, such as revolving objects or projectiles. More than one object can be analyzed in any video, which can lead to detailed comparisons of multiple objects that are in the same system. The disadvantages about using video analysis are that all the equipment needed is very expensive and many clubs and sports people may not be able to afford this sort of equipment and the sort of help needed. Another disadvantage is the they could easily break and therefore will need to be looked after carefully. Diet is an important part of the overall programme of an elite athlete. Carbohydrates are the source of energy in the majority of sports to some extent and should form the main part of an athlete’s diet irrespective of their sport. A dietary analysis can determine the breakdown of an athlete’s diet in terms of carbohydrate, fat and protein and will also give a very specific analysis of whether there are deficient in any vitamins and minerals. The dietary analysis will enable athletes to make changes to their diet that will promote recovery and enhance performance. It is important that athlete’s competing in such sports maintain body weight in a sensible way. Many sports allow athletes to be overweight early on in the competitive year with tighter weight restrictions for the main competitive season. A dietary analysis will enable sports nutritionist to determine what areas of the diet can be altered to help athletes make weight without drastic weight loss, dieting and dehydrating which will all have a negative effect on performance. Dietary analysis combined with a body composition assessment will enable sport nutritionist to be able to determine how much body fat can be realistically lost to help an athlete achieve their target weight in a healthy way. Sports such as rugby, rowing and weightlifting are likely to benefit from an increase in muscle mass (muscle hypertrophy). A dietary analysis will determine whether the amount of calories being consumed is sufficient to build muscle. Additional calories will be necessary to increase muscle mass. However, the quality of the increase in calories must also be maintained to ensure any increase in weight is in lean muscle and not fat. By assessing the diet through a dietary analysis it can determine if the breakdown of foods is optimum to promote an increase in muscle mass (in conjunction with a strength raining regime). Contrary to belief a substantial increase in protein intake will not enhance muscle mass. The increase in calories should come from low fat carbohydrate choices that contain protein, vitamins and minerals. By combining a dietary analysis with a body composition assessment athletes can insure that any increase in muscle mass is an increase in lean muscle with a minimal increase in body fat. Excessive body fat has been demonstrated to be associated with such health-related problems as coronary artery disease, hypertension, adult-onset diabetes, obstructive pulmonary disease and osteoarthritis. Too little fatness, as seen in individuals with eating disorders, exercise addition, and certain diseases, such as cystic fibrosis, can also lead to serious physiological dysfunction (Heyward & Stolarczyk, 1996) . Considering the profoundness of the health problems associated with too much or too little body fat, it is no surprise that the assessment of body composition has become a widespread and meaningful evaluation used by personal trainers. The blood lactate profile is the most important predictor of endurance performance potential in steady-state events (e.g. time trials in cycling, cross-country skiing, rowing, speed skating, triathlons and running races, especially marathons). The lactate profile test is the gold standard used by elite endurance athletes to determine optimal training intensities and is the most effective way to track the progress of training. After determining a lactate profile, we will provide training zones based on both heart rate and wattage. Being able to measure training intensity is the most important thing an athlete can do in order to improve. Taking a blood lactate test at the UF Orthopaedics ands Sports Medicine Institute is the best way to do this. Many athletes and physiologists have used lactate analysis over the last decade as a tool for predicting endurance performance. Specifically, the higher the percentage of VO2max, or the higher the pace at which the lactate threshold occurs, the fitter the athlete. The lactate test reveals the level of training in which there is balance of producing and using up lactate. The lactate threshold level is a measure of an athlete's maximal steady state, the level of intensity he or she can hold over a period of time for example during a 40-km time trial on a bike or a 10k pace for a runner. Telemetry systems are ideal for monitoring and recording muscle functionality from long distances without wires or cables. Surface EMG signals are transmitted from the athlete to the recording computer by radio frequency waves from as far as 300 yards. The U.S. Ski Team, professional sports teams, the American Sports Medicine Institute, and others use telemetry systems in their sports research to evaluate muscle function and athletic performance. Their objectives are to prevent injuries, determine optimum exercise routines and speed up a player's recovery time. These are true examples of advanced technology aiding in the analysis of technique to improve human performance. To aid in identifying an appropriate intervention. To maximise the athlete's motivation and adherence to the program. The first step is for the coach to introduce to the athlete the idea of Performance Profiling and how it can help to direct training to areas of specific need. This process can be aided by a sense of mutual trust, and it should be made clear that any information gained about the athlete will remain strictly confidential. Coaches should stress that there are no right or wrong answers involved in the process but that honest appraisal will facilitate a more productive outcome. The coach needs to explain that the process will focus on the athlete's current feelings regarding their preparation for competition. What in your opinion are the fundamental qualities or characteristics of an elite athlete in your sport/event? Spend five to ten minutes listing the qualities or characteristics that the athlete feels are important. If an athlete finds this difficult, the coach can use prompts, but it is for the athlete to decide on what characteristics are chosen. The coach should try to get the athlete to list the key psychological factors, but the same process can be applied to technical skills or physical attributes, such as strength, speed, agility, balance etc. In this step, the athlete should try to identify 15 to 20 characteristics. The next step is for the athlete to rate each of the identified characteristics. On a scale of zero (not at all important) to 10 (extremely important), the athlete rates the perceived importance of each characteristic for an elite performer in their particular sport/event. The athlete uses the same zero to 10 scale to rate their current perception of themselves in relation to an ideal state of 10. A calculation is then carried out to determine the 'Discrepancy' value. The higher discrepancies indicate areas that may need to be addressed through training or other intervention. The table below provides an example of these calculations for part of an athlete's performance profile. For this particular athlete refocusing after errors and concentration are key concerns that could be addressed. This can be via intervention strategies such as self-talk or a quick set routine, depending on the exact circumstances and preferences of the athlete. Reassessment should always relate to the same characteristics identified in the initial profiling process and be conducted every four to eight weeks. Performance Profiling appears to be a tool that is particularly useful for aiding in the design of specific mental, physical and technical training programs. The central involvement of the athlete in the process is a key strength that may boost motivation and promote adherence to any intervention strategies devised. It may also facilitate the coach-athlete relationship by promoting dialogue and addressing any perceived discrepancies. Additionally, the profile can be used as a monitoring device to assess the effectiveness of any interventions and highlight areas of good and poor progress. There is discrimination and disadvantage in sport for ethnic minorities. * Racism means not treating people of different races equally. Racists often hold stereotyped views about people from different ethnic backgrounds. Stereotypes lead to sporting myths about what different people can and cannot do. as it makes they feel like a unit a good example of this is an Army uniform. During our BTEC course when we first started we had the opportunity to go onto the high ropes course, this made the group work together and formed a strong bond between us. The game is believed to have descended from ancient Irish football known as caid, which date back to 1537, although the modern game took shape in 1887. How Sports Participation Is Encouraged Sports participation is encouraged by all children having to do physical education at school. Body Composition Females have a larger percentage of body fat (approximately 27%) compared to males (approximately 15%), which is a disadvantage in virtually all weight bearing events. Fat is dead weight', in that, although it provides an energy reserve store, it requires energy to transport it during sporting events. He recognised that personality was more dynamic than Eysenck suggested and could fluctuate according to the situation. So according to Cattell, a football player who never normally shows signs of aggression, may show signs when involved in a certain situation.